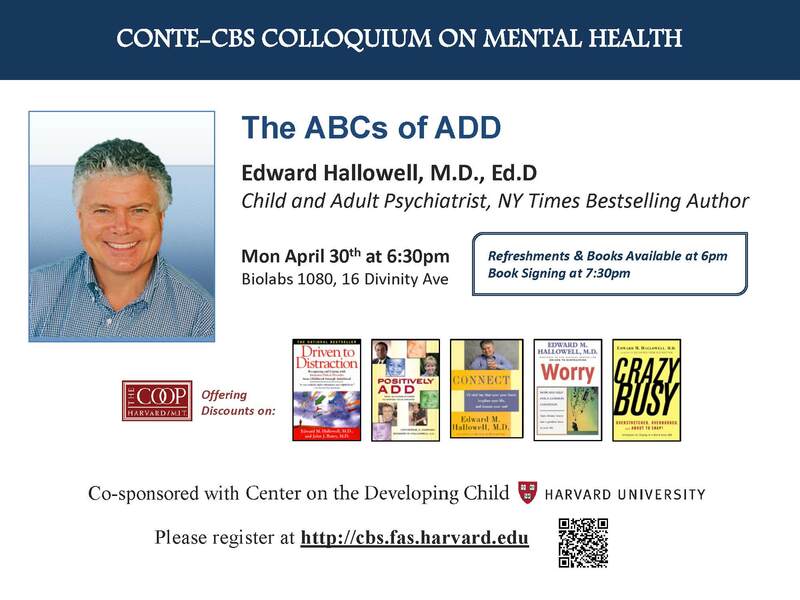 Psychiatrist Edward Hallowell, MD, EdD, will be presenting on “The ABCs of ADD” at the April 30 Conte-CBS Colloquium on Mental Health. In honor of his visit, let’s take a look at some common questions about this disorder. What is ADHD/ ADD and why it is important? The acronym ADHD refers to Attention Deficit Disorder with Hyperactivity, and ADD refers to Attention Deficit Disorder. In his book Driven to Distraction (1994), Dr. Edward Hallowell, a Harvard-trained psychiatrist, who himself has both ADHD and dyslexia (a reading disorder), defines ADHD as an early onset biological disorder that is usually characterized by inattention and impulsivity, that may or may not include hyperactivity. He explains that as children who have these characteristics mature, they may be seen as having challenging behaviors or be seen as the “dreamers” in a classroom setting. 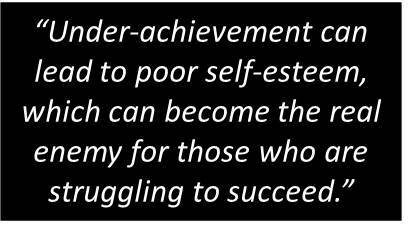 Ultimately, the characteristics of ADHD and ADD may lead to academic failures, social dysfunction, and skill deficits. In turn, according to Dr. Hallowell, “Under-achievement can lead to poor self-esteem, which can become the real enemy for those who are struggling to succeed.” Because risk factors associated with ADHD may include high rates of injuries, cigarette smoking, substance abuse, and in some cases delinquency, Dr. Hallowell stresses the importance of education, diagnosis, and treatment, which may or may not include medications, to help those in need turn their lives around. What is the underlying neurobiology of ADHD/ADD? According to an article by Thomas Spencer, M.D., and colleagues, “Overview and Neurobiology of Attention-Deficit/Hyperactivity Disorder” in the Journal of Clinical Psychiatry (2002), ADHD is highly heritable and may be associated with deficits in the prefrontal cortex and related subcortical system. In fact, they report that many studies have found an association between ADHD and several genes, including those regulating dopamine, norepinephrine, serotonin, y-aminobutyric acid (GABA), and androgens. Further, in a study done in 1990, Alan Zametkin and his colleagues at the National Institute of Mental Health discovered that adults with ADD metabolized glucose at rates 8% lower than adults without ADD, with a decrease in metabolic activity that was the largest in the prefrontal and premotor regions of the brain. According to Dr. Hallowell (1994), the frontal region is the major regulator of the brain. It keeps impulses in check, allows us to plan and anticipate, and serves as the place where we anticipate behavior. These results are just a few of many providing some important clues as to why children and adults may have difficulty with paying attention and impulse control. How many children are currently diagnosed with ADHD/ADD? Do their characteristics mimic other possible diagnoses? According to the Center for Disease Control and Prevention, parents surveyed in 2007 reported that 9.5% or 5.4 million children ages 4-17 had been given diagnoses of ADHD. This represents a 22% increase in ADHD diagnoses since 2003. The frequency of parent-reported ADHD diagnoses varies substantially by state. It is more frequently seen in males than in females, with the highest rates among multiracial children and those covered by Medicaid. However, we must use care in interpreting these statistics. Currently, there is no single, objective test to identify ADHD, and the characteristics of ADHD can mimic the characteristics of sleep issues, oppositional defiant disorder, conduct disorder, and/or anxiety disorders. In a New York Times article by Kate Murphy, “Attention Problems May Be Sleep-Related”, Murphy states that a number of children respond to sleep deprivation by becoming wired, moody, and obstinate, and they have trouble focusing, sitting still, and getting along with peers. Sleep experts noted that children who lose as little as half an hour of sleep per night can exhibit behaviors of ADHD. Medications such as Ritalin, Adderall, or Concerta, which are used to treat ADHD, can cause insomnia, and in turn exacerbate sleeplessness, which may be the root of the problem for some children. Who is qualified to diagnose ADHD/ADD and how does one get a diagnosis? In their book Delivered from Distraction (2005), Dr. Edward Hallowell and Dr. John Ratey explain that ADD/ADHD can be diagnosed by child psychiatrists, psychologists, developmental pediatricians, pediatric neurologists, and child psychologists. Family physicians and general pediatricians may be able to help as well. They stress that it is most important to have someone who has experience diagnosing and treating ADHD/ADD. They also explain that ADHD/ADD is diagnosed using a combination of personal and medical patient history, input from family, friends, current and past teachers, and possibly medical and neuropsychological testing, if indicated. Testing can take as little as an hour, or a number of weeks. In their book Delivered from Distraction (2005), Dr. Edward Hallowell and Dr. John Ratey discuss some of the golden keys used to treat ADD/ADHD. They advocate for diagnosis, identification of the patient’s strengths, education, and changes in lifestyle. Lifestyle changes may include getting enough sleep, appropriate diet, exercise, meditation, positive human contact, structure, counseling, and a variety of therapies that may or may not include medication. Who is Dr. Edward Hallowell and how has he helped the world better understand ADHD/ADD? Ever since he was diagnosed with ADHD in adulthood, Dr. Hallowell has dedicated his career to helping thousands of families, children, and adults, identify and treat the symptoms of ADHD. He is the founder of the Hallowell Centers in both Sudbury, Massachusetts, and New York City, New York. Some of his books include titles such as, Driven to Distraction, Driven from Distraction, The Childhood Roots of Adult Happiness , Connect, Worry, Human Moments, and Super-Parenting for ADD. In his writings and teachings, Dr. Hallowell does a beautiful job of capturing the stories of the children, adults, and families, who have struggled with the characteristics of ADHD and learning disabilities. He stresses that, “Children who do the best in life, are those who feel connected both at school and in the home.” The innovator of “Shine for Doctors” and “Mining Magnificent Minds” for teachers, Dr. Hallowell emphasizes the importance of education and collaboration around the issues of ADHD. Through his lectures and writings, Dr. Hallowell has inspired thousands living with ADHD and learning disabilities to reach out, connect, and find access to the resources that will help them learn how to recognize their gifts and work towards their dreams. Hallowell’s talk was an unscientific treatment of the subject. I had wrongly assumed that Harvard would elicit a more sophisticated discussion, but it was a glossing over of his justification for medication.